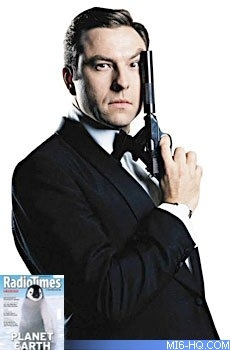 Little Britain star, David Walliams, has styled himself as the ultimate ladies man, emulating Sean Connery's classic 007 pose, in a new tongue-in-cheek photo shoot for the Radio Times - reports Metro. 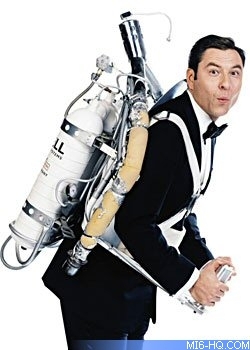 In the hilarious set of photos, Walliams gets to grip with the Bond jet pack used in the film Thunderball and tries out the Aston Martin DB5 from Goldfinger. Walliams who successfully swam across the English Channel, will be hosting the ITV1 documentary 'My Life With James Bond' next month. The Little Britain comedian said: 'I would still love to be in a Bond film. But I think I've blown that by going on TV wearing a dress,' Walliams said. 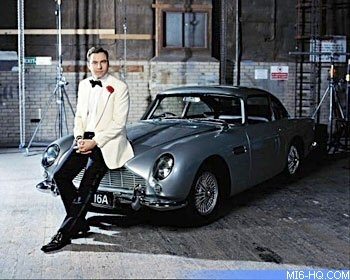 The documentary is timed to celebrate the forthcoming release of new Bond film Casino Royale, starring Daniel Craig. Thanks to `The Arkichef` for the alert.